Good morning! As you can see, it’s been an amazing year at the University at Buffalo! There’s a lot happening at UB. And there’s a lot happening in the world because of UB—because of the efforts of all of you. Every day, we continue to elevate our university in excellence, impact, and stature. That is the guiding objective of our UB 2020 vision. As we realize this vision, we are bringing the eyes of the world to UB and to Buffalo as a leading site for innovative research and discovery; as a place where bright students flock for opportunities they won’t find elsewhere; as a worldwide destination for excellence in the arts, culture, and creativity; and as a global hub for the best in health sciences education, research, and clinical care. Through UB 2020, we have been making noteworthy progress toward all these goals. I’m happy to have this opportunity to share some of our recent success, map our next steps, and look together toward what’s on the horizon for UB and for our larger community. As you know, this year we kicked off the fall semester in a very exciting way. On August 22nd—as thousands of UB students arrived on campus for the start of a new academic year— we had the incredible honor of hosting the President of the United States. It was a proud day for UB and a testament to our incredible staff, students, and volunteers, who made a very complex undertaking appear seamless—with almost no time to prepare! Afterward, some of the White House staff told me they’ve done hundreds of events like this all over the world—but they’d never worked with a team as exceptional as our UB staff and student volunteers. 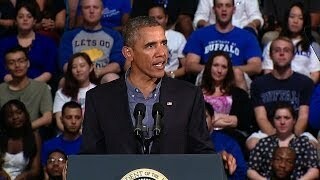 They affirmed what we all know so well—that we have truly world-class people working here at UB! Over 7,200 people joined us that day in Alumni Arena as President Obama unveiled his ambitious plan for ensuring greater access to higher education. In this major policy address, President Obama focused on two key issues: access and affordability, and graduation rates. These issues are very close to UB’s heart. We are proud to be at the epicenter of this national conversation. Across the country, educators, policy experts, students, and families are continuing to debate what the President’s address signals for the future of U.S. higher education. As a nation, we are comparing enrollment data and time-to-degree statistics. These kinds of details are usually left to the experts—like those of us who work in our admissions and academic advising offices. Suddenly, they are being discussed around the kitchen table and on morning talk shows. Thus far, this debate has focused mostly on two things: getting more students in the door; and sending them more quickly out the door, degrees in hand. These are important issues, to be sure. But we are not talking enough about what happens in the vast space in between entering and exiting higher education. We need to be talking more about the college experience itself. As I see it, that is the ultimate determiner of opportunity, for our students and for our nation as a whole. Opening the door to higher education is only the first step. Affordability alone does not equal opportunity. And access to a college education means nothing if it does not open other new doors for our students in the future. Yes, affordability is critically important to higher education access. And graduating in a timely way is critical to ensuring our students are able to enter the job market successfully, and with minimal debt. It is worth noting that UB is an acknowledged leader in both regards. We have been nationally recognized for our leadership in opening access and providing students with an exceptional education. We are committed to building even further on this leadership. As part of the New York SUNY 2020 legislation enacted two years ago, UB implemented a rational tuition policy to help students and families plan for educational costs in a predictable way. The revenues from this new policy are enabling UB to build even further on our commitment to ensuring access. Meaningful access is provided only when students have direct, intensive contact with research and educational experiences that prepare them to be knowledgeable and engaged citizens. And so our first concern must be for the quality and innovation of the education we are providing to our students. Too often, we forget that the aim of higher education is not just to prepare students for jobs. It is to prepare them to lead, innovate, and contribute to the world around them. The world our students will enter as they exit our doors is rapidly shifting. We need to prepare them to be intellectually nimble so they can compete successfully for jobs that may not yet exist, and so they are ready to solve whatever challenges the future will bring. And this is exactly what a research university education is designed to do. At UB, we make sure our students work alongside faculty in their labs and out in the field and that they have a seat at the bench as critical research discoveries are made, and a voice in the debate about public policy issues. Opportunities like these literally change lives—those of our students, and those of the communities they will enrich. Creating this life-changing impact is at the heart of our UB 2020 vision. And it is at the heart of what you do every day. And engaging even more effectively with our communities, locally as well as globally. In pursuit of these goals, we have focused on strategic investments in faculty excellence; in the student experience; and in the physical environment that supports excellence. Of course, there is always more work to do. But we can be very proud of the tangible outcomes we are achieving. We are building faculty strength across the disciplines. We are expanding academic opportunities and resources for our students. And we are partnering even more effectively with our communities—here in Buffalo and around the world. Let me give you one timely example that encapsulates the impact of all this progress—our downtown campus. I hope you will join us next Tuesday for the medical school groundbreaking—a major milestone for UB and our community. This transformation of our medical school represents a bold new era for our university and for our region. It will put UB and Buffalo at the forefront of academic medicine, world-class medical education, and state-of-the-art health care. The medical school will also grow in size and scope—adding many new faculty positions between now and 2016, when the newly completed building will open its doors to the Class of 2020. And having the medical school downtown will have a tremendous impact on the Buffalo community—bringing 2,000 more UB faculty, staff, and students downtown every day. And it will expand our collaborations with key partners on the Buffalo Niagara Medical Campus, including Buffalo General, the new Oishei Children’s Hospital, and Roswell Park. As we prepare to move the medical school downtown, we are also hard at work in realizing our long-range vision for the South Campus. Despite ongoing challenges in the capital budget climate, we continue to make steady progress in fulfilling our physical master plan for all three campuses. Our campus master plan—North, South, and Downtown—is just one example of how, together, we are achieving our vision of excellence for our university and our community. The past year is full of other examples of our institutional progress and its impact. We are making national news for the impact of our research in key areas like materials science, diabetes, and school bullying. We are making an even greater name for Buffalo as a worldwide arts and cultural destination through groundbreaking exhibits and performances by our faculty, and major international conferences that bring the world’s leading cultural scholars to UB. We are transforming the living-learning environment. For example, this summer we celebrated the grand opening of the new home for the Educational Opportunity Center—the sixth building opening on our 3 campuses in the past 2 years. And our food services staff are earning national recognition for the quality, innovation, and sustainability of campus dining—from using locally sourced foods to recycling cooking oil into biodiesel. We are expanding opportunities for learning—in and beyond the classroom: One example is UB This Winter. This short winter session gives our students new avenues to get ahead in their studies—including new study abroad programs. We are building on our long legacy of leadership in sustainability through our innovative use of alternative energies and green design across our campuses, and hands-on learning opportunities like those in the new Sustainability Academy. And we are earning a worldwide reputation for building a strong knowledge economy from our student entrepreneurs, who are changing the way business is done to our internationally recognized incubators that cultivate thriving spin-off businesses. Because of the collective impact of these institutional achievements, we are garnering global recognition. And because of this global stature, we are attracting even more of the world’s best students to UB and to Western New York. Through the wide range of perspectives they bring, these students help foster the global campus culture so essential to the UB student experience. Through UB 2020, we are also continuing to recruit more of the world’s best and brightest faculty and staff to UB, across the disciplines. We are fortunate to have an incredibly strong faculty and staff base—they are among the strongest assets we offer our students. Two days ago, we had the pleasure of honoring some of these outstanding individuals at the Celebration of Academic Excellence. I know many of them are with us today. I want to take a moment to applaud all of our honorees. And we’re steadily building these ranks of outstanding faculty and staff. In the last year, we welcomed over 180 new staff and nearly 150 new full-time faculty, including the largest group of new tenure-track faculty in decades. Our faculty continue to earn honor and recognition for their achievements and contributions. Six UB faculty joined the SUNY Distinguished ranks this year, the highest faculty rank in the system. And our faculty have earned numerous international honors and have been inducted as Fellows into prestigious professional organizations in their fields, including the American Association for the Advancement of Science, the National Academy of Education, and the American Mathematical Association. These faculty achievements are a rich source of inspiration to our students, who have also distinguished themselves greatly over the course of the past year. We now have the largest total enrollment in UB history, including the largest international enrollment we’ve ever had. But more importantly, the caliber of the students we are attracting to UB is steadily rising at the same time. Many of our students are achieving international recognition for their research, including highly competitive Goldwater, National Science Foundation, and Fulbright scholarships. The quality of our students is a great testament to the outstanding mentorship of our faculty and staff. In turn, this recognition testifies not only to the excellence of our students, but also to the leadership they will provide as UB graduates. The White House recognized UB alumnus Norman McCombs with the National Medal of Technology and Innovation. The American Bar Association honored Law School graduate Tina Meyers for her clean water advocacy. Recent graduate Foo Keat Mak became the first UB alumnus to receive a coveted Gates Cambridge Fellowship. And our distinguished alumnus Dr. Zhou Ji, former Minister of Education in China, was elected to the prestigious U.S. National Academy of Engineering. Our alumni have never been more deeply engaged in UB life. Over the past 2 years, I have had the pleasure of meeting alumni across the country and around the world. Everywhere I go, I hear people talking about how Buffalo is on the move—and how UB is a big part of that movement. Just last month, we had nearly 800 Buffalo grads join us for an alumni event at the Pierce-Arrow museum. One of those alumni, who graduated from UB in the late 1960s, told me he hadn’t seen this level of excitement around UB in decades. There is tangible excitement building around what we’re doing at UB. And that is thanks in large part to your achievements. You are the difference UB makes in the world around us. That is our university’s mission—changing the world for the better through our ideas and our actions. Achieving this objective to the fullest is the core of our UB 2020 vision. It is at the heart of all our efforts, not just over the past year, but the past decade. 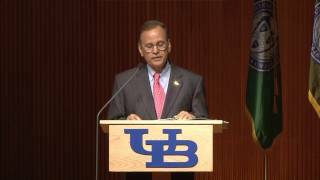 In my State of the University address a year ago, I outlined what I saw as the next evolution of the UB 2020 vision: an initiative we call Realizing UB 2020. This initiative is a strategic framework for building on our progress and momentum—and taking it to the next level. Realizing UB 2020 is about defining what truly sets us apart as a world-class research university—our distinctive opportunities for leadership and impact. Over the past year this effort—led by Provost Zukoski—has generated remarkable campus engagement from our faculty, staff, and students. This is a comprehensive effort with many facets. Today I’d like to highlight a few key initiatives moving forward as part of Realizing UB 2020. First, is a thematic approach to how we organize our curriculum, pursue research, and approach challenges. These five themes are: environment, health, humanity, innovation, and justice. This thematic approach is about enhancing how our students and faculty engage with broadly defined social challenges. These five themes build on and advance our strategic strengths in a university-wide context not only in terms of interdisciplinary research, but across all aspects of the university, from campus operations to our engagement with our communities. Second, this paradigm will feature prominently in the undergraduate experience. Our faculty and staff are redefining the general education curriculum with this thematic approach in mind. Our goal is to provide current and future students with a rigorous, relevant education that prepares them to lead in their communities as critical thinkers, as collaborators in responding to complex problems, and as citizens of the world who have learned from many cultures and life experiences. With these goals in mind, we are transforming our curricula so that all UB students gain significant global experience, participate in experiential learning, and complete a capstone project. Teams of faculty and staff are working now to implement these major shifts across the curricula. This is truly an exciting time to be a UB student. The opportunity to engage directly with leading faculty is a critical element of the experience we provide our students. And this brings me to the third aspect of Realizing UB 2020 that I’d like to address today: faculty scholarship and creative activity. Building faculty strength across the disciplines has been a core strategy of our vision from the outset of the UB 2020 initiative. And it is a fundamental element of Realizing UB 2020. Over the past several years, our deans across the disciplines have collaborated in a cluster-hiring strategy that has enabled UB to build extraordinary robustness in our faculty. And we are sustaining this level of progress, working toward our goal of hiring 250 new faculty. UB is known worldwide for innovative, cross-disciplinary research that responds to critical 21st century challenges. The Realizing UB 2020 effort is focused on expanding this impact even further. Let me give you just one example of a major initiative moving forward as part of Realizing UB 2020: That is the RENEW institute, which addresses the broad range of scientific, political, and social issues related to energy, water, and the environment. UB has great faculty capacity in a wide array of fields that intersect with these issues, from environmental engineering, to law and management, to public health. Over the past two years, through the 3-E initiative, our faculty have brought forth several distinct proposals for research initiatives related to this complex set of issues. Many interesting points of intersection emerged among these proposals. Now they are coming together in the form of the RENEW institute as a single multi-faceted effort with tremendous potential impact—regionally and globally. As a public research university, this is what our mission is all about: to enrich the quality of life through our ideas, discoveries, and contributions. Our students, faculty, and staff bring this mission to life each day. You are advancing research that responds to vital societal needs. You are providing a relevant, rigorous curriculum that prepares students to compete and lead in the 21st century. And you are partnering with our communities to make the most of these contributions. As you can see, together, we’ve made tremendous progress over the past year. This is a time of great excitement, momentum, and change. Through it all, our vision remains steadfast: to pursue academic excellence with a critical impact in advancing the public good, here and around the world. It is your engagement, your contributions, and your commitment that transform this vision into a reality. Because of your efforts, the University at Buffalo is establishing itself as one of the world’s great research universities. And because of your achievements, the world is taking note. Thank you for all that you do, every day, to realize our vision.